The Consumer Price Index added o.4% in May as prices inched up in every major component of consumer spending except for food. 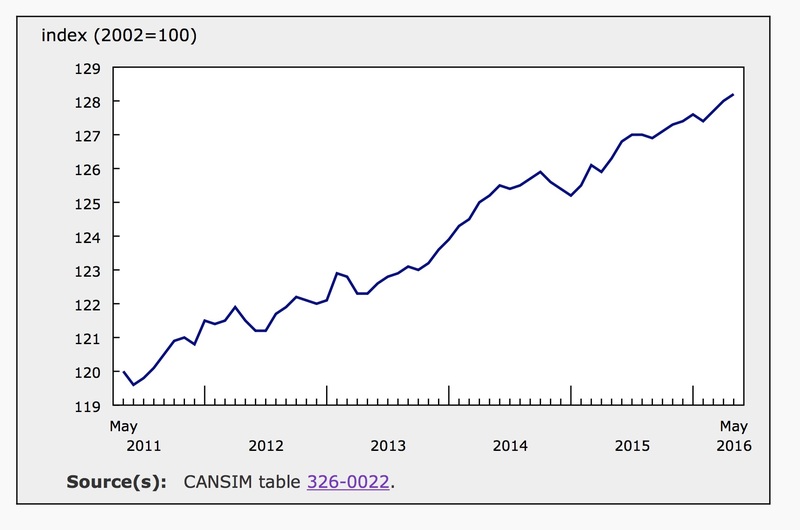 This is according the monthly inflation report from Statistics Canada. According to their report, annual inflation slowed to 1.5% in May from 1.7% in April. This was slightly below expectations, which were for an annual rate of 1.6% and a monthly rate of 0.5%. 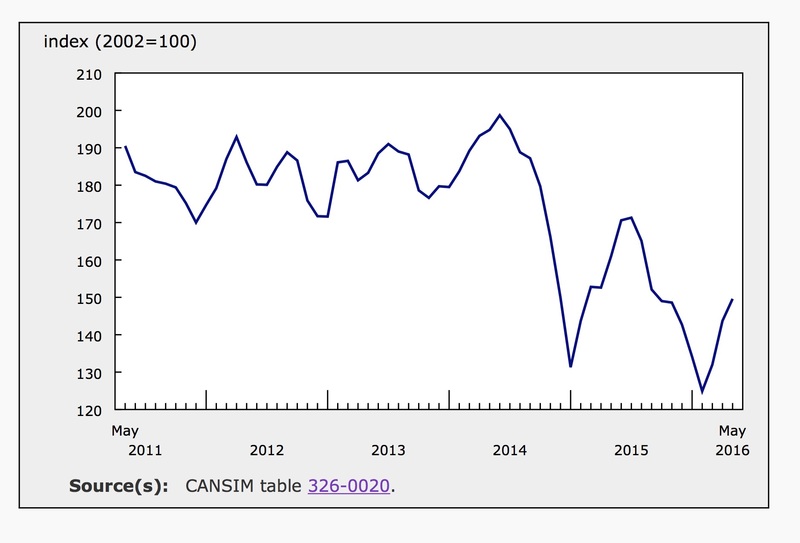 On a seasonally adjusted basis, inflation was 0.2% for the third consecutive month (the graph below shows seasonally adjusted monthly inflation over the past 5 years). Core inflation excludes items with volatile prices to measure longer term underlying trends. The core index climbed an annual 2.1% in May, down from 2.2% in April. For the month, core prices were up 0.4% and with seasonal adjustments that number is 0.2%, in-line with April’s core seasonally adjusted inflation. The CPI climbed 0.4% in May following an increase of 0.3% in April. The food index fell 0.3% after having fallen 0.5% the previous month. The price of food purchased from stores reportedly fell 0.6% as the vegetable index dropped 4.4% month over month. Fruit and nut prices also fell 0.4% in May. Higher prices for meat and seafood bolstered the food index slightly. Meat prices were up 0.3% and fish and seafood prices increased 0.8%. The index for food purchased from restaurants inched up 0.2% in May compared to 0.3% in April. The transportation index did not increase as much in May (up 1.3%) as it did in April (up 2.0%), largely due to slowing growth in the price of gas. Nationwide, gas prices were 4.1% higher in May and 8.9% higher in April. Inner city transportation, included in the transportation index, added 1% in May. The graph below shows the highly variable index for gasoline over the past 5 years. The Bank of Canada’s core index was up 0.3% in May compared to up 0.2% in April. Within this index, shelter costs gained 0.1%, as they have every month since November of last year. The index for rent added 0.1% while the index for tenants’ maintenance, repairs and other expenses fell 2.1% month over month. The index for household operations, furnishing and equipment grew 0.4% in May and 0.2% in April. Clothing and footwear prices were flat in May for the second month in a row. Health and personal care only added 0.1% for the month following a spike of 0.7% for the previous month. After seasonal adjustments, the CPI was up 0.2%. Inflation accelerated in only two components on a seasonally adjusted basis in May versus April. The clothing and footwear index gained 0.6% in May and 0.2% in April. Also, the index for recreation, education and reading inched up 0.1% with seasonal adjustments following April’s decline of the same amount. For the year ending in May, prices rose in every major component of the consumer price index. However, the overall rate of growth slowed from April, largely the result of slower growth in the food index, which accounts for about 16.4% of the CPI. Food prices were up 3.2% in April and were the most significant contributor to overall inflation that month. However, the food index increased only 1.8% in May. The deceleration can be attributed to slowing growth in the price of fresh fruits and vegetables. The fresh vegetable index gained 1.9% in May compared to 11.7% in April. Similarly, the fruit index recorded annual inflation of 4.9% in May versus 11.0% in April. Even with seasonal adjustments, the food index fell 0.5% in April and 0.4% in May. The energy index declined 3.6% over the 12-months ending in May following a decline of 3.2% in April. This index is defined by statistics Canada as a “special aggregate” that includes electricity, natural gas, fuel oil, fuels and gas as well as parts and accessories for recreational vehicles. Gasoline, which tends to have a major impact on inflation, was 7.1% cheaper in May compared to a year earlier. In April, the price of gas had fallen 5.8% year over year. It is worth noting that in both February and March, the gasoline index posted annual declines over 13%. Despite the slowdown in the growth of gas prices, the transportation index accelerated 1.1% in May from 0.9% in April. Excluding food and energy, annual inflation was 1.9% in May – the lowest annual rate this year. Shelter costs increased 1.4% year over year in May and April. The index for household operations, furnishings and equipment ticked up to 2.0% from 1.6% the previous month. The clothing and footwear index grew 1.1% following an annual decline of 0.1% in April. Inflation slowed in the health and personal care component to 1.3% from 1.7% in April. Similarly education, recreation and reading gained 1.6% versus 2.4% in May versus April. Alcoholic Beverages and tobacco products recorded annual inflation of 3.2% in May compared to 3.4% in April. 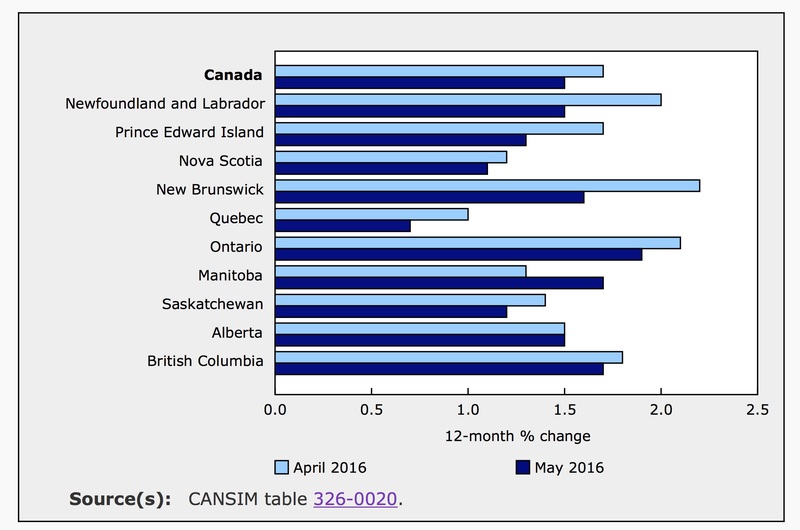 Inflation slowed in six provinces in May compared to April. 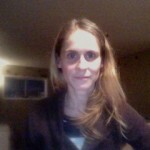 Prices were flat in Alberta and accelerated in Manitoba. Variation among the provinces was largely due to the uneven distribution in changes in the price of gas. 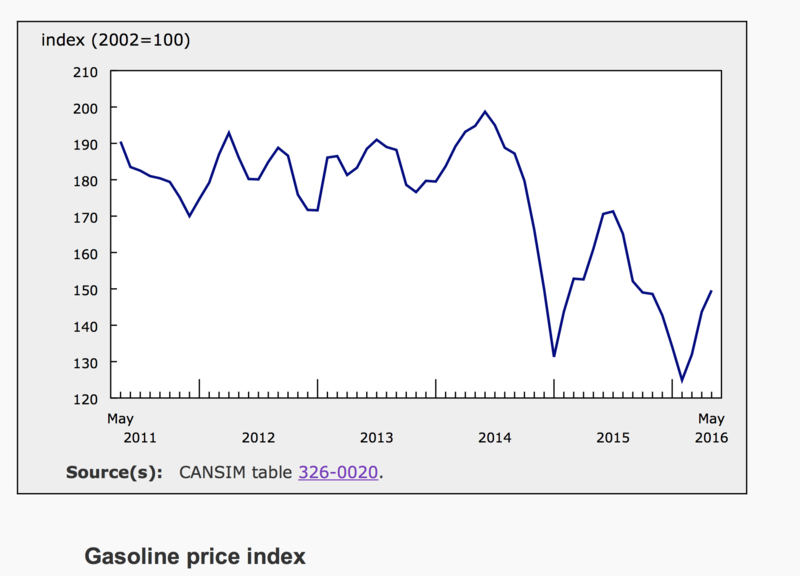 While the gasoline index was higher in every province, it grew significantly more in some provinces such as Alberta (6.7%) and Saskatchewan (6.4%) compared to others such as Nova Scotia (2.3%) and Quebec (2.3%). Today’s inflation report may have been a slight disappointment as it was marginally below expectations and below the Bank’s 2% target. However, seasonally adjusted monthly numbers and core monthly numbers show sluggish but steady and consistent growth in prices throughout the economy. In his recent progress report, Governor Poloz outlined the challenges facing the Canadian economy as we adjust to lower oil prices while also trying to recover from the financial crisis. Red flags include sluggish exports and high consumer debt. Governor Poloz attributes much of the economic recovery to the Bank’s decisions to cut interest rates. Interest rates will likely remain unchanged for the foreseeable future. There is little expectation for a rate hike until the last quarter of 2017. Today’s inflation report should have very little impact on these expectations.